Gicleés are made using the latest Epson/Canon professional inkjets and our papers are hand-picked from professional ranges to give maximum choice and quality to the final print. The word Giclée (“g-clay”), is derived from the French verb gicler meaning “to squirt or spray”, Giclée, is used to describe a fine art digital printing process combining pigment based inks with high quality archival quality paper to achieve Giclée prints of superior archival quality, light fastness and stability. Our Giclée prints are created using a Canon IPF8400 innovative 12-colour pigment inkjet system with image processing technology that delivers a wide colour gamut, smooth graduations, less bronzing and highly scratch-resistant prints. The Giclée printing process involves squirting or spraying microscopic dots of pigment-based ink onto high quality art paper or canvas. The image is colour corrected to attain the closest possible match to the original work if required. The digital information is fine tuned to the type of paper or surface on which the image is to be printed, further ensuring fidelity to the original. Giclée prints are printed on a variety of substrates or mediums, the most common being cotton rag, canvas or Baryta paper. At 212 Productions we only use genuine artist papers. Cotton rag or ‘watercolour’ Giclée paper has been popular for many years of Giclée printing. These fibrous papers transform a photograph into a painterly, soft image that adds a classy, decorative feel making it perfect for everything from portfolios to art prints for exhibitions. Digital C-types are real photographic prints, created on light sensitive professional photographic paper using a finely balanced red, green & blue light source. A digital C Type is any photographic print that has been exposed using digital technology, rather than traditional analogue (otherwise known as ‘darkroom’) techniques. In an analogue setting, an enlarger, an optical apparatus similar to a slide projector, projects the image of a negative onto a sheet of photographic paper whilst controlling focus, intensity and duration of light. With a digital C Type this part of the process is controlled from a computer and the paper is exposed using lasers or LEDs rather than a bulb. The second part of the traditional process is much the same however: the paper is processed in a photographic developer, followed by bleach fix before being washed to remove the processing chemicals. So a digital C Type is a traditional photographic print, made from a digital file rather than a negative. 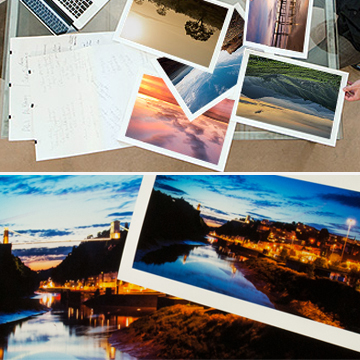 Many customers think that a ‘digital print’ has to be a Giclée print but this is not so. A Giclée print is quite different, using no chemistry or light sensitivity.